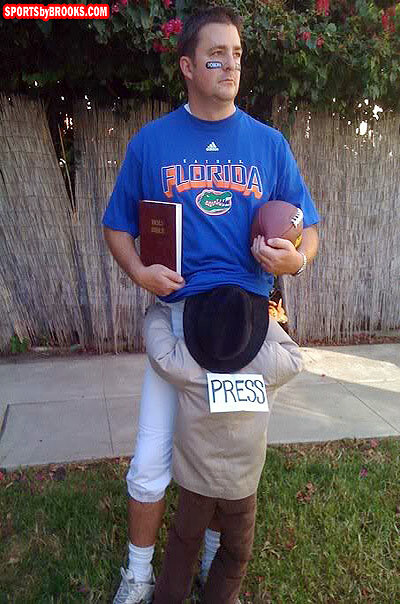 This is the absolute BEST sports-related Halloween costume I’ve seen this year, well besides the incredibly hot girls who dress up as refs, but that doesn’t really count. University of Florida’s Tim Tebow was anointed as the greatest college quarterback ever by the media hordes who can’t slobber his knob fast enough despite the fact that he simply isn’t that good a quarterback according to all of the NFL. I absolutely love this. I also cannot wait for the greatest QB to enter the NFL and proceed to be worse than Danny Wuerfful.